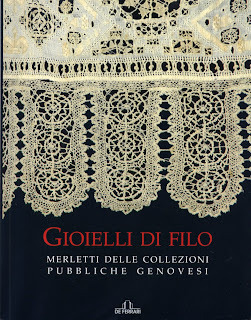 Jewels of Thread is the English translation for the title of the catalogue for the laces in the Genoese public collections. This catalogue of the first of a planned series of exhibitions of almost the entire lace collections of the Civiche Collezioni Tessili [Civic Textile Collections] and the Collezione Tessile della Soprintendenza al Patrimonio Storico Artistico della Liguria [Textile Collection of the Department of Historic Artistic Heritage of Liguria]. 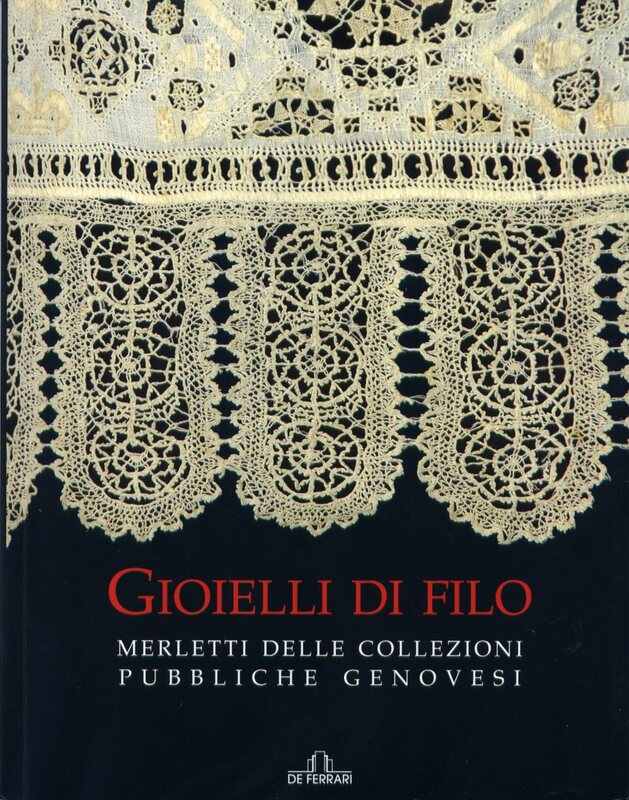 Written in Italian, it has a wealth of information regarding the laces in the collections (which number about 300 pieces dating between the 16th and 20th centuries) but also the history of lace in Genoa, mechanical laces, commercial production in Genoa, a glossary and of course a rich bibliography to investigate if you want more information on Genoa and lace. In this volume, Maria Daniela Lunghi and Loredana Pessa have shared some of the wealth of their knowledge on these subjects and have offered detailed particulars on the lace pieces in the collections. This is a valuable resource also for the names and dates of contributors and collectors, if you have been trying to access information relative to this area of study, this catalogue is a gold mine of information. Needle lace pieces include borders and inserts, tablecloths, collars, sleeves, scarves, frills, handkerchiefs, doilies, furniture coverings, bonnets, baby shoes, some religious articles and a bolero. Bobbin lace pieces include borders and inserts, cuffs, collars, shawls, ties, sleeves, head coverings, furniture coverings, handkerchiefs, bibs, veils, fans, doilies, parasol covers, a sleeveless jacket and a bed spread. There is a large assortment of items of a wide variety of mechanical laces (including whole dresses!) and also quite a lot of Macramè, crochet lace and metallic bobbin laces. These collections are held at the Palazzo Bianco by the DVJ (Damask, Velvet, Jeans - Textile Fashion Museum) in Genoa. Thanks to M. Daniela Lunghi for sharing this with us!